After adjusting for price rise, ‘real’ wages of India’s largest, most poor class, have barely grown in the past four years. Neither Modi, nor BJP have even a thought to offer these 15 crore workers. Since Narendra Modi came to power in 2014, wages of general agricultural workers have increased by only about 6% per year at current prices. If you adjust for price rise, then the real wage increase is a paltry 2.5% for men and 2.7% for women per year. 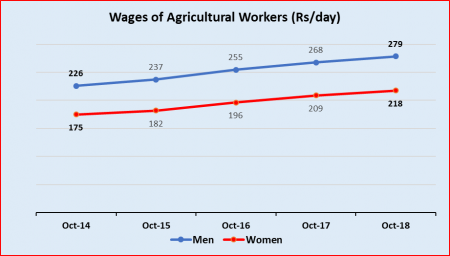 In October 2018, the last month for which rural wage rates are available from the Labour Bureau, wages of male workers stood at Rs.279 per day and Rs.218 for women workers. Four years ago, in October 2014, the rates were Rs.226 and Rs.175, respectively. Even in nominal terms, that is at current prices without adjusting for inflation, the increase in wages is abysmal – just about 6% per year for both men and women. But in these four years, prices of all essential commodities – food, fuel, clothing – and services like education and healthcare have increased considerably. That is why a better picture of earnings emerges if this inflation is discounted from the wage increase. This can be done by using the Consumer Price Index for Agricultural Labourers (CPI-AL) which is also released every month by the Labour Bureau. Doing the math in the standard way, it emerges that the growth rate of real wages is a mere 2.5% per year for men and 2.7% for women. This negligible increase in wages can be seen in the chart below, where both lines are practically horizontal over the past four years. 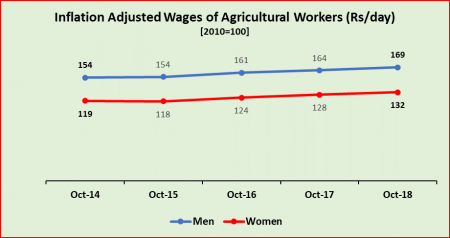 Prior to Modi’s rule, agricultural wages rose sharply – during October 2010 and October 2014, nominal wages rose at about 22% per year while real wages increased by 8-9% per year. This was a period of high inflation, that is why the big difference in nominal and real wages. This rise was primarily driven by the implementation of the rural job guarantee scheme -- MGNREGS -- which provided alternative employment and better wages, increasing the bargaining power of agricultural wages. However, with Modi’s squeeze on funding of the Mahatma Gandhi National Rural Employment Guarantee Scheme or MGNREGS, and his government’s disastrous policies vis-a-vis the farm sector, this increase has been wiped out. 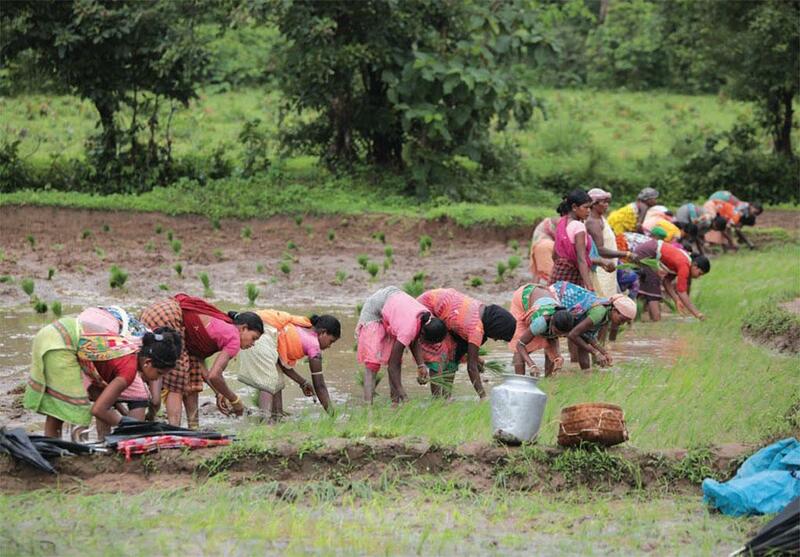 There are an estimated 15 crore agricultural workers in India, making it the single largest economic class. They are also at the bottom of the economy, undertaking hard manual labour which is seasonal because of crop cycles. As a result, these daily wage rates actually apply for only those few months when work is at full swing, especially during harvesting seasons. For the rest of the year, agricultural labourers seek work in other occupations, including MGNREGS. They also work as construction labour, brick kiln workers, salt pan workers etc. In off seasons, in order to survive, these workers often migrate to cities and towns, working as rickshaw pullers, head-load workers and in other manual labour occupations. Nearly half of India’s agricultural labourers are dalit and adivasis, thus facing inhuman feudal oppression in the form of caste discrimination and violence. In all the calculations of Modi et al, all the promises of achhe din (good days) and sabka saath, sabka vikas (development for all), there is nary a mention of this vast invisible workforce that is holding up the countryside and even urban life through various assorted services. While making grand plans of doubling farmers’ incomes, there is no mention of agricultural workers’ wages. Neither are they on the radar for bank loans or debt waivers. Modi’s speeches are silent about crores of these workers, as are Bharatiya Janata Party (BJP) president Amit Shah’s exhortations to party workers for winning elections. The Rashtriya Swayamsevak Sangh, mother to BJP, and various associates like Vishwa Hindu Parishad and Bajrang Dal, never spare a thought on these hapless labourers even as they dream of mobilising the so-called Hindu nation for various glorious tasks, such as building temples and statues, and becoming the world’s teacher (vishwa guru). Even now, with the BJP/RSS preparing for a bitter election battle in a few months, the ruling party and its leadership remains blissfully ignorant about the agricultural workers’ plight – and their simmering anger against the ‘jumla sarkar’ (a government of hollow promises). Where did People of India and Other Parts of South, Central Asia Come From?